This is a matched set of right and left horns that honk when a rubber ball is squeesed. The balls need to be replaced. It measures 12 inches in diameter. 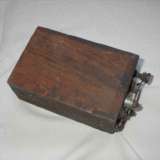 This is a original coil that I believe is from a Model T Ford. The word "Ford" is stamped on the edge near the end with the contactor.